There's the 1890 diorama above. Those are real kittens! If Walter Potter had asked "is it necessary?" he would have had to say "no". That's really clear. "Is it necessary?" provides a more permissive standard than "animal rights," but a less permissive standard than "animal welfare". There really is plenty of space between welfare and rights, a fact that seems to be anathema to both rights supporters and conservative welfarists. Both sides wants us to think "if you reject this, you'll be stuck with that," and it's not true. Rights OR welfare is a false dichotomy. If we ask "is it necessary?" we'll have to stop doing many things to animals that we normally take for granted. We'll have to stop making dioramas out of kittens, upholstering sofas with leather, creating pretty hats out of baby seal fur, putting animals on display at circuses, etc. What about eating animals? Is it necessary? I've been rereading Tom Regan's 1983 opus magnum The Case for Animal Rights, and it's interesting to see how adamant he is that animal products are unnecessary. Every single nutrient in meat (he focuses on meat) can be obtained from plant foods, he says. The latest thinking on this seems to say otherwise. If you only ate plant foods, the nutritionists now say, you would wind up deficient in vitamin B12 - a vitamin that grows from bacteria in animals and has no plant sources. Long term, B12 deficiency can cause serious problems, so vegans are advised to make up for what they're missing by taking a vitamin supplement that's grown from bacteria in a lab. When Regan said meat isn't necessary, he meant other foods deliver the same nutrients. A revised version of the book would have to say that meat and other animal products aren't necessary, because we can get the same nutrients from a combination of plant foods plus a pill. Some will say--but if plant foods don't deliver all the nutrients we need, then animal foods are necessary after all! Which goes to show: the rough notion of the "necessary" is serviceable, up to a point, but then we need to clarify what we mean. When we say X is "necessary," partly we're saying that we get some important benefit from X. We'd lose something that means a lot to us if we gave up X. Inevitably, we also have to make a judgment of balance--are there enough benefits to justify the cost? We can think about costs, benefits, and balance in lots of different ways, the utilitarian way being just one. But those are the key ingredients when we judge that X is necessary (or not): costs, benefits, balance. So--what do we gain by getting our nutrients from food (and just food)? Michael Pollan says food is more trustworthy because it delivers packages of nutrients, without our having to analyze what exactly is in the package. But when he urges us to "eat food" (his first commandment), what's at stake is partly "existential." What are we going to put inside of ourselves--earth's bounty, so to speak, or a chemist's concoctions? Pollan thinks it's good to continue being what we are--animals--and continue that elemental connection animals have to food. What weight should we give to eating food and just food? I have always followed Pollan's first commandment, and I'm also a reluctant consumer of medicine. So the food argument has some attraction for me. Are we entitled to get our B12 from real animals, instead of from lab-grown bacteria? Not if the costs to animals are enormous. But what if we treat animals humanely, as Pollan urges us to do? How far must we go toward artificiality in order to be ethical? UPDATE: Who was Walter Potter? How did he come by the kittens? This is informative. Far be it from me to disagree Jean, but the 'is it necessary' question appears to risk begging substantive questions. Is it necessary to kill kittens for a diorama? The taxidermist may well argue that it is. Similarly, the recreational hunter or the Eskimo may claim that killing animals is necessary for them. Your claim that it isn't necessary to do these things imports a normative evaluation. The real question is - what is the animal's death necessary *for* - and does this benefit justify the harm to the animal? I think this question of the reasons (and interests) at stake is far more illuminating that the necessity question - though perhaps that is useful as a shortcut. My other concern about necessity is that there is a potential naturalistic fallacy lurking underneath it. So one way of unpacking the question about the necessity of meat in a diet is by asking whether it is necessary for meat to be eaten in a 'natural' human life. But there are real problems in working out what counts as natural (are vitamins obtained from naturally occurring microorganisms natural, do we have to ask about necessity in a hunter-gatherer life? ), and, more importantly, further questions about the normative weight of naturalness. Let us set aside the questions about health, since there is no evidence that a vegan diet (supplemented with B12 appropriately) is harmful - at least for adults. Imagine that to avoid animal suffering required a wholly artificial diet - perhaps one synthesised in a replicator like the ones in Star Trek. Let us stipulate that the amount of pleasure experienced in the eating of such food is exactly akin to that currently involved in eating good quality vegan cooking. In that case the answer to 'is it necessary' might be yes, or might be no - depending on what you mean by necessity. But would we be ethically required to adopt this diet? I'm not terribly convinced about the B-12 argument. If you look at the role of B-12 in human biology, its a vitamin that is actively recycled. A little B-12 lasts a LONG time. We can get this B-12 from bacteria, like many people are doing in pill form, or we can get B-12 from not being so meticulously clean about our veggies. Back to the kittens.... 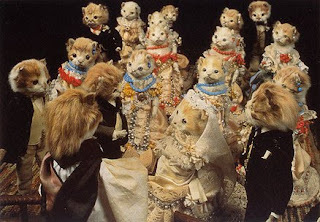 Were the kittens killed to make the diorama? Or was he just utilizing stuffed kittens (I'm assuming that they're stuffed.... I would have to imagine getting a herd of kittens into that pose would be nigh impossible) that had died foro ther reasons? We'll probably never know.... But I don't see anything particularly wrong with taking kittens that were already dead, stuffing them, and making art out of them. Back to Pollan: I'm not sure that there is a superiority to "eating food." Maybe this a product of my generation though, since I grew up on flintstone vitamins and such. But given the choice between herbal/holistic curative foods and a pill, I'd pick the pill. I know what I'm getting, and the amount I'm getting. Now we extend that to food, I think the argument is similar. Sure there may be things that I don't realize I need from real food that I'm not getting from the processed food... But B-12 is B-12, from a pill or from the bugs on a plant. The underlying point is that there is something morally valuable with is "natural." I think your last question sums that up (artificiality). Why is artificiality morally wrong? Why is it bad in ANY sense? And what exactly makes B-12 produced by bacteria and concentrated into a pill artificial? The idea that consuming B12 in pill form is "unnatural" strikes me as odd, given that almost everything we eat is "unnatural". What food that humans eat has not been (some combination of) genetically modified (by hundreds or thousands of years of selective breeding, if not by modern genetic engineering), grown and harvested using a high degree of technology (knowledge, machinery, material and energy inputs), brought to market via a sophisticated transportation network, and then prepared for consumption using stoves, utensils, etc.? To single out B12 pills as "unnatural" is to make, ahem, an artificial distinction. I think in everyday life we often don't have to precisify too much. We can just immediately see that X is necessary or unnecessary. But as I say in the post, sometimes it's not so clear. So then we do need to sharpen up the concept,and the best way to do that seems to be in terms of costs, benefits, and balance. That's still very rough (should we aggregate like utilitarians? ), but at least it's a beginning. So--no, I'm not just buying some "naturalistic" unanalyzed notion of what's necessary. I love the question about the Star Trek diet (so to speak). It gets around Michael Pollan's worry about how we don't know what the necessary nutrients are. Your replicator synthesizes "whole foods." Also, it lets us eat FOOD, not pills. But it's artificial as can be. Costs to animals are reduced to nil. Is there some "good" lost, because people are getting their food from factories instead of directly from nature? Pollan would say Yes--there's the satisfaction of being an animal living in its natural state. I think when I am wearing my official philosopher's hat, I have to find that weak. But when I take off the hat, it (honestly) moves me. I like the natural world. I'd like to continue being part of it, in certain elemental ways. Wayne, I'm pretty sure he was killing kittens to make the dioramas. Taylor, The issue I'm trying to raise is not directly about "natural vs. unnatural". We do lots of things to food that are not terribly natural. For example, the process of creating chocolate is tricky indeed! It would be nuts to think chocolate is bad because of that. The issue is rather food vs pills. Pollan's reasons for saying "eat food" are not as simple as "because it's natural." He thinks food is more trustworthy (because we can't analyze it yet), and he thinks there's an existential "plus" to retaining elemental connections to the natural world. I'm inclined to agree at least partly with Dom that the concept of "necessity" may not quite get the traction that you might like to get out of it. For one thing, I think the notion that "we can just immediately see that X is necessary or unnecessary" is probably not the case, unless by "we" we mean "we wet liberal animal rights sympathizers and activists," and other relevant groupings of "we." When I was in my early 20s I was a committed vegetarian and part time vegan (soy milk, pretty much only ate dairy through baked goods). Then I got a job doing construction work, where I was doing very hard labor about 10 hours a day. At the time I was eating about 4,000-5,000 calories a day, mostly through eating constantly (and I do mean constantly, I would carry bags of food around with me). Anyway the whole thing was getting quite obnoxious, and to make a long story short I wound up eating meat at some point during this time frame. I cannot describe how profound the physiological sense of well being was. It was both instantaneous and quite pleasant. I went from having a constant gnawing hunger to feeling satiated. Honestly I was shocked. I still remember it quite vividly. Now, some caveats: this anecdotal story is not intended to show that people need meat all the time, or even that everyone would need meat in my situation (or even strictly that I NEEDED meat). It is only to indicate that I think the dietary issues get whitewashed here. I don't think human beings are uniform enough in their habits or metabolisms for us to be able to say: well this is what we definitively need to or do not need to eat. My general response when I hear people going off on "what our bodies really need" is simply: that's just BS. There is no abstracted human body just floating around out there that we've devised a perfect nutritional picture of. The problem is that anecdotal stories such as mine can be easily rigged to bring out the conclusions that people want to come to. So there is a strong urge to say: but the nutritional science say that X, and you must bow down to the nutritional science rather than your own experience. All of which is to say that "necessity," particularly in the area of nutrition, is going to be a very sticky subject. It certainly cannot be used like the bludgeon some people think it can. Which goes to Dom's point, and the reason he postulates the nutritional pill of the future that definitively solves these problems. A pill that, unlike the protein shakes that I drank in my early twenties to stop my growling stomach (and yes I ate a wide variety of other non meat proteins), actually would have worked. Of course I don't work like that anymore, and I no longer think it's "necessary" for me to eat meat. But I think that these nutritional issues really are quite a bit more difficult than they are taken to be by the vegetarians of our socio-cultural milieu. P.S. You really need to see Daybreakers. I plead not guilty. I said sometimes it's obvious whether something is necessary. Nobody really thinks the kitten dioramas are necessary. Other things can be seen to be (un)necessary upon just a little bit of honest reflection. So--if it's eating meat as a construction worker, or as a pregnant women (yes, I did), or whatever, I think there's a cost/benefit/balance question to be answered. That's ultimately what judgments of "necessity" are all about. If you handled 28 days later daybreakers will be nothing. A bit gross, but it really is about food ethics. Trust me :) There is even a scene with a little milk in the coffee...so to speak. And I am sympathetic to your idea of "necessary" despite playing devil's advocate. I think that necessity or something like it plays a de facto role in these discussions whether it is made explit or not. I really like the Star Trek analogy that Dom brought up. We must have wrote our comments almost at the same time, because I didn't see his post. I'd agree with your sentiments.... I like the natural world. I think there is extrinsic value to it, aesthetic value to it, and possibly even some intrinsic value to it. But to prefer it over the artificial just because its not artificial seems constructionist.... Like racist and speciesist, discriminatory against constructs. Hmm... the link says that the cats were already condemned to death.... to prevent overpopulation. So he used their bodies for art. I'm not sure if I would have a problem with that. KNOW exactly what foods a human being needs to flourish. Wayne, When I read that I was slightly relieved. OK, so he wasn't running around killing kittens just for his dioramas. But he WAS waiting in the wings, as people killed kittens for other reasons. Maybe a tad problematic? Vampirism is viral so it spreads quickly. Daybreaker vampires can ONLY survive on human blood. Animal blood doesn't do the trick. Vampires that don't drink human blood basically devolve and go crazy (become bestial). So as the virus spreads people who become vampires have a choice: either "eat" people (they don't eat them, but they do farm them for blood), or die. The plot revolves around a guy who hates being a vampire, hates needing to drink the blood of human beings, and is desperately trying to find a "blood subsititute" that will sustain vampires in lieu of humna blood (like Dom's Star Trek pill). That's how the stage is set, and the twist is built from there. So you can see how it might tie into the notion of necessity. This article presents a somewhat non-realistic dichotomy between foods that contain B12 and a pill, where in reality foods are more complex, as most foods we eat are constructed from many ingredients, like corn flakes, fortified bevrages, meatless burgers, enriched wheat flour and many more, They do contain B12, and they are vegan. One may claim that the B12 is a processed ingerdient, surely, as many others are, almost every non-raw food contain them, even a frsh steak is injected with hydrogen-monoxide, water, meat extender, and sodium nitrite, but we still consider it food. I would say that fortified foods are basically foods with pills added to them. The pill part is not food. The preservatives (etc) added to food aren't food either, but they do play a different role. They aren't there to make up for nutritional deficiencies in people's diets, but to prevent spoilage. It wouldn't be crazy to feel positively about preservatives, but negatively about vitamin additives. Of course, some people dislike both. Michael Pollan says--stay away from processed food, whether the processing involves fortification or preservatives or "extenders" or flavorings or any other wonders of the food lab. "Science Can Determine Moral Values"
If Kant couldn't do better, can we?